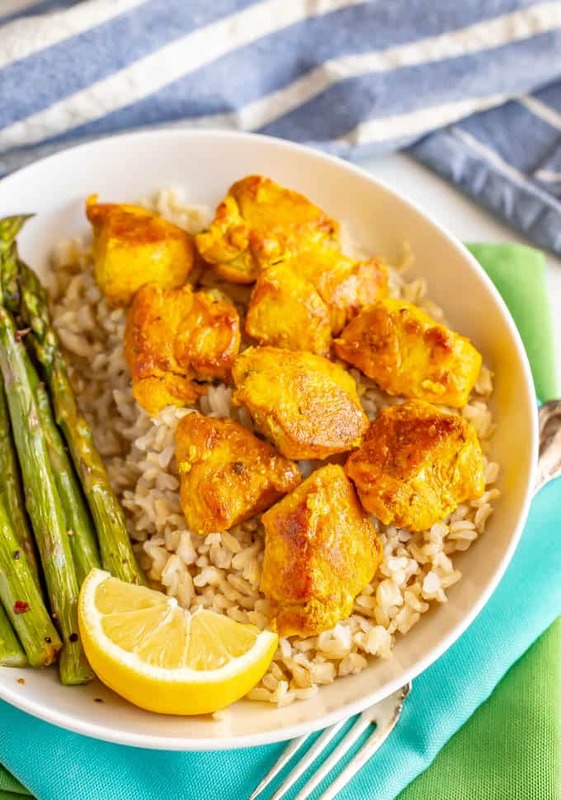 Easy turmeric chicken is full of warm, rich spices and comes out perfectly tender and juicy! 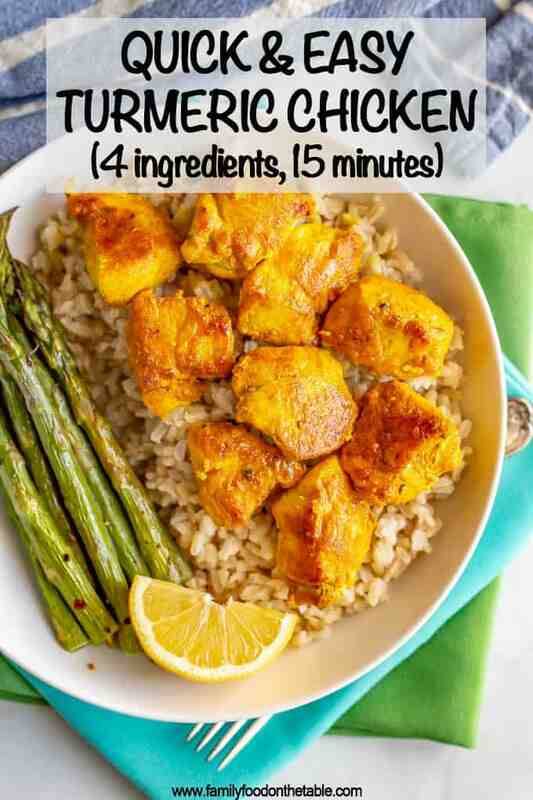 Plus, this recipe is just 4 main ingredients and ready in 15 minutes! I soaked in every bit of this past weekend. We had a soccer game, a few birthday parties, a play date and a school function. All fun stuff and mostly nice weather, too, which is always a bonus! But also, I’m going to be gone for the next 4 weekends. 😳 It’s because I’ve got lots of fun things coming up, but that means weekdays will be even more crazy to try to cram in all the normal house/family/day-to-day stuff I get done on weekends. So being a bit lazy and lounging around was a really nice way to just chill this weekend. Now it’s Monday though, and, well, here we go. Full speed ahead! 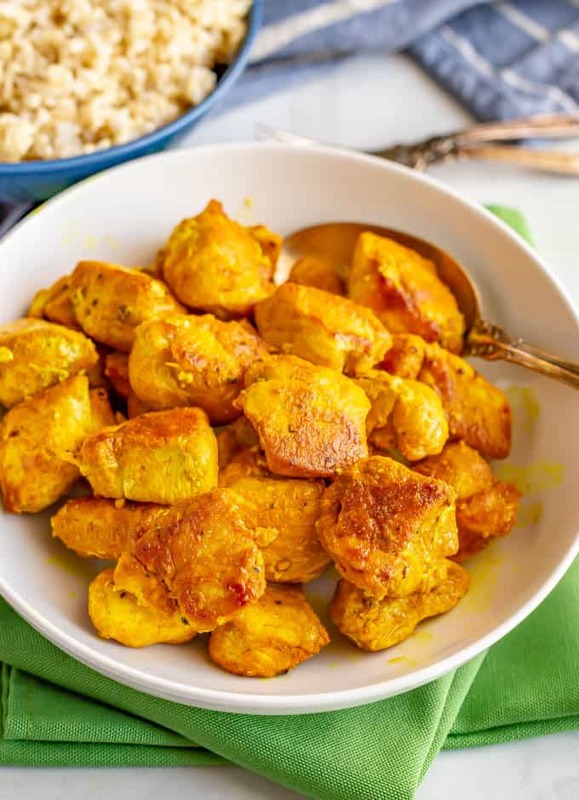 Today’s easy turmeric chicken recipe has been a favorite of mine for a few years now! 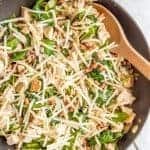 It’s a great go-to type of recipe to have when you get home, look in the fridge and think to yourself, now what am I going to do with that chicken? 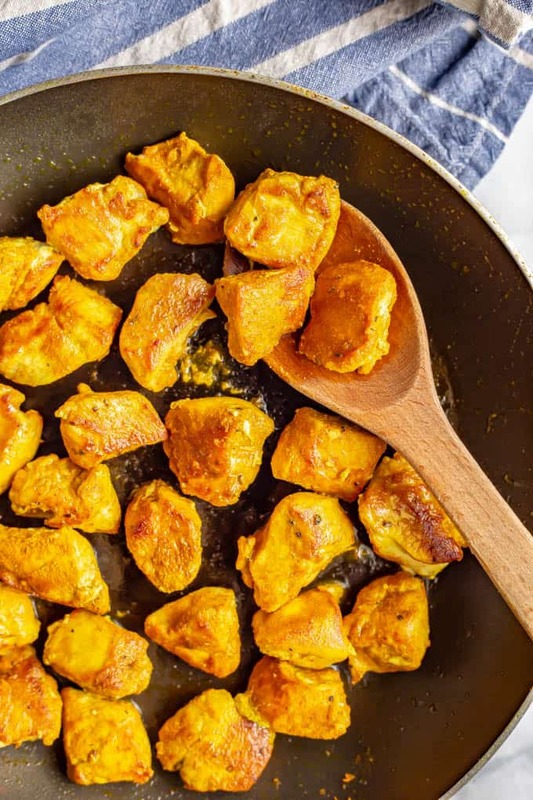 It’s similar in that way to my paprika chicken, which is also a quick and easy one that cooks up using this same method of cutting cubed chicken and then searing it in the skillet. Plus, the squeeze of fresh lemon juice adds such a bright pop at the end! I’ve got a few tips and FAQs and serving ideas to share on this dish coming up. Just trying to be helpful. Cutting the chicken into smaller pieces helps ensure they cook evenly and more quickly. It’s a favorite trick of mine! 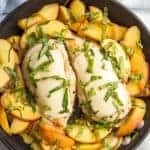 I use boneless, skinless chicken breasts but you could also do this with boneless, skinless chicken thighs that you cut up into smaller pieces. The cayenne here is optional. It adds just a hint of heat but can definitely be left off as well. Turmeric is a spice that comes from the turmeric plant. It is commonly used in Indian and Asian cuisines. Turmeric is a key spice in curry and is often used to flavor or color curry powders, mustards, butters and cheeses. It has a warm, slightly bitter taste. It’s also known for its medicinal purposes. One of the key active compounds in turmeric is curcumin, which acts as an antioxidant and anti-inflammatory component. Turmeric may help with exercise-related inflammation and muscle soreness, as well as managing oxidative stress, research suggests. It has also been used for treating rheumatoid arthritis, skin cancer and digestive disorders. Some also believe it may help in depression, memory, heart disease, various cancers and boosting longevity. More research is needed in all of these areas. However, turmeric obviously has a lot to offer! You could even serve this with some roasted potatoes (like my easy spicy roasted potatoes). Is it me or does almost everything go with roasted potatoes? Then you just need a steamed or roasted veggie side and you are set! 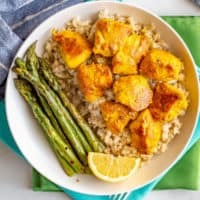 But if you want to get more creative, you can use this easy turmeric chicken as the protein for any kind of grain and veggie bowl you can throw together. 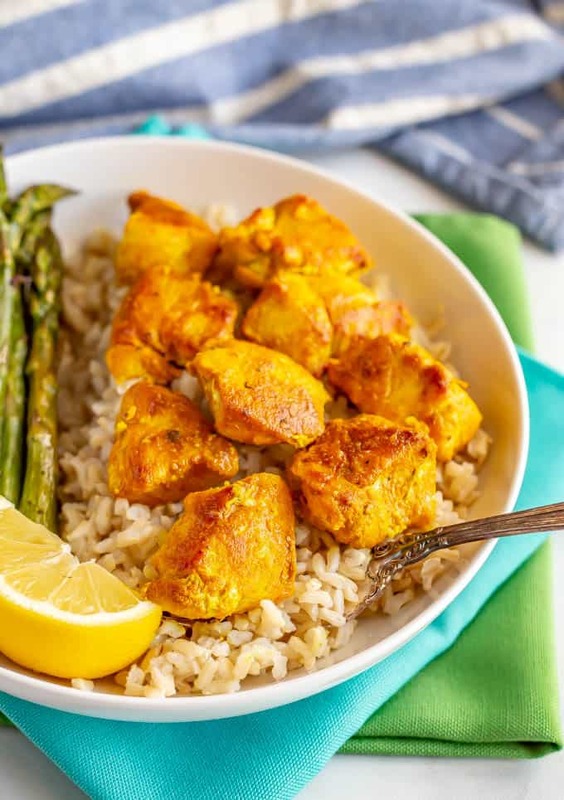 Finally, this turmeric chicken makes a great wrap! I love doing that with leftovers — or if I’ve meal prepped this in advance. Lunch time winning right there! 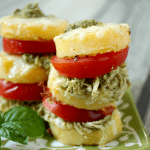 I hope you give this recipe a try; I think you’re gonna love it! P.S. 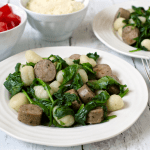 Are fast and easy dinners right up your alley? Me too. 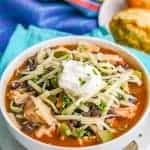 Check out all of my 15-minute chicken recipes or browse my easy chicken recipes with 5 ingredients or less. Heat a large skillet over medium heat and add olive oil. 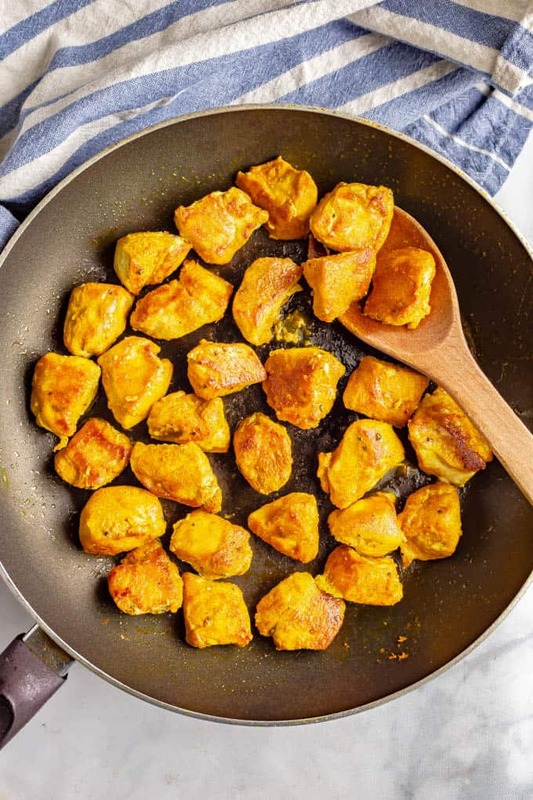 Season chicken pieces with turmeric, cumin, salt, pepper and cayenne, if using. Add chicken to the pan and cook until cooked through, 8-10 minutes, stirring occasionally. 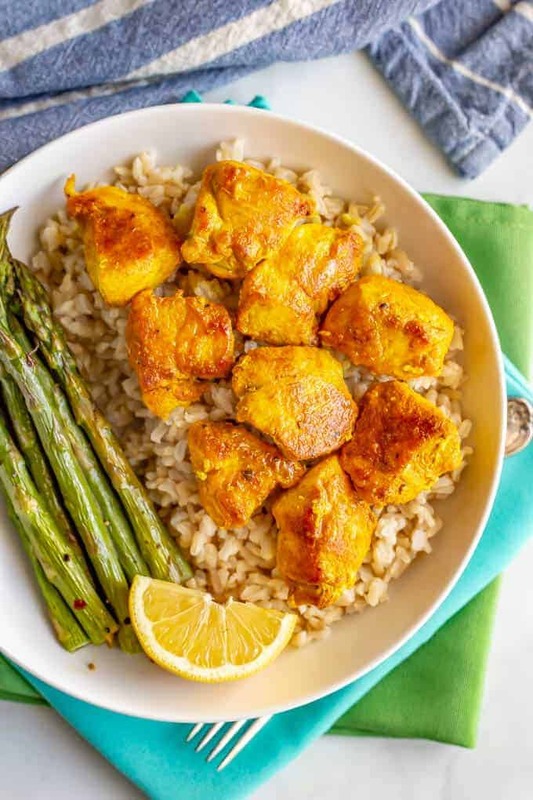 Squeeze lemon juice over cooked chicken, serve warm and enjoy! 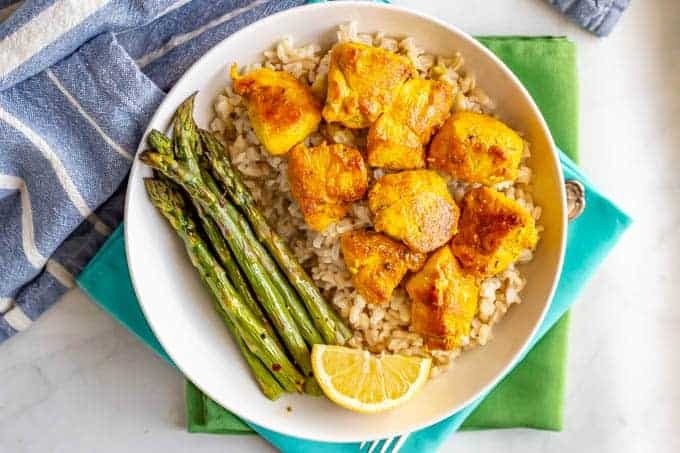 We love serving this over steamed brown or basmati rice with a veggie side for a complete meal. 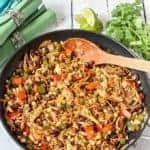 It's also a great meal prep recipe for grain bowls or wraps.